…and why you should check structures using both. One of the most used structural standard for certification in the field of offshore structural engineering in The Netherlands is DNV-RP-C201. This is one of the results of a study organized by FEM Data Streamliner. There are major differences between standards, especially if you compare DNV and ABS. Edgar Peetam (FEM Data Streamliner) explains. FEM Data Streamliner provides a tool that can be used in addition to software that checks structures using the Finite Element Method (FEM). FEM Data Streamliner also contains the strength requirements as laid down in standards provided by major certification authorities. The two most often used standards are DNV, which is the most popular standard in Europe, and ABS, the biggest global player. These standards differ and comparing structures to the standards of DNV and ABS will lead to different results. 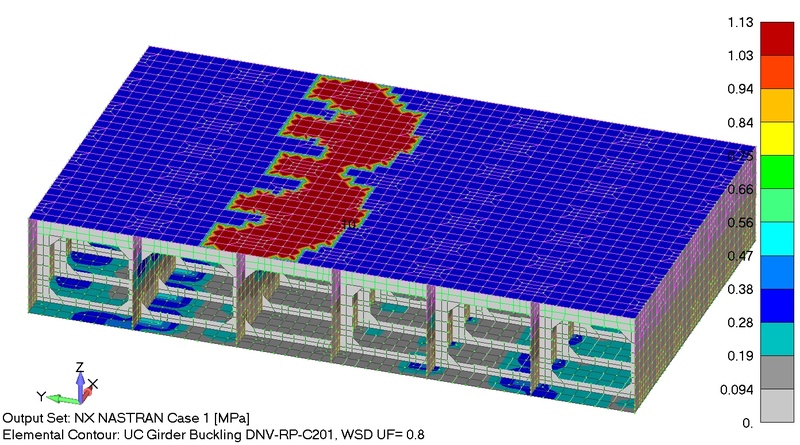 Comparison plate buckling DNV vs ABS. Need for better and faster strength analysis of structures. Code checkers needed in structural engineering. The study was organized by FEM Data Streamliner and executed by Nasano Management in May 2016. 36 experts in the field of structural engineering had an extensive interview in which they were asked about important subjects in their field. The questioned engineers work in offshore industry, marine industry, crane construction and heavy mechanics. 31% of the interviewees is an analyst or calculator. Others hold positions as team leader (28%), constructor (19%) and project leader (17%).